DAVID DIXON PORTER. 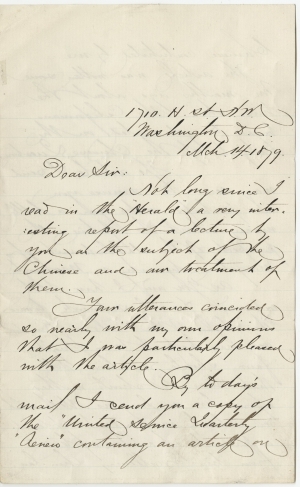 Autograph Letter Signed, to “Reverend Dr. Newman.” Washington, D.C., March 14, 1879. 3 pp., 5 x 8 in. In 1879, the slogan of the Workingmen’s Party of California was “The Chinese Must Go!,” and the anti-Chinese hysteria was reaching a widespread volume across the state, a sentiment that both Porter and his compatriot Newman seemed to have sided with: “The article was written some two months ago about the time when the Californians began to get excited on the subject of the Chinese Question. 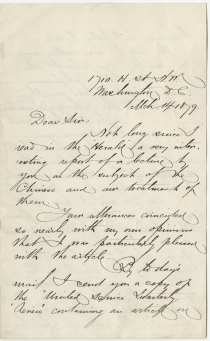 The article I send may serve to amuse you and perhaps make you a little uneasy about the future prospect of the establishment of a Mongolian dynasty in Washington.” This rise of hostility was followed by the 1882 Chinese Exclusion Act, which would make history as the first measure restricting emigration to the United States based on race. Very good. 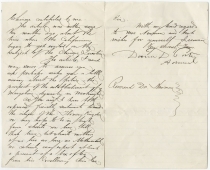 Two horizontal mailing folds, one passing through the signature. Light creasing, mild separation to the bottom of central hinge, repaired complete tear through the closing sentiment.